Tensions are still high in Tripoli as the battle for the control of the capital and the parliament continues between the UN-backed Government of National Accord (GNA) and the National Salvation Government (NSG) supported by a coalition of Islamist groups known as Libya Dawn. Ghweil has tried to calm down fears that the rivalry between the two governments will be fatal as he gave assurances that “he did not want to spill any Libyan blood.” He also acknowledged inviting the Tobruk-based government to form a new government “together” but the proposal was rejected. 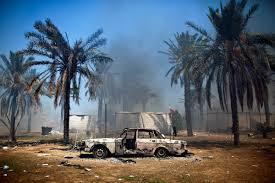 The government in Tobruk fled Tripoli after Libya Dawn overpowered its forces. The clashes in Tripoli are being termed as a coup d’état by some militia groups in the country while some are in support of NSG’s actions against the GNA. The militia groups consider that the GNA is backed by western countries and that it has already failed in its mission. Elsewhere, the US has increased its airstrikes on the militants of the Islamic State in Sirte and Libyan troops on the ground are making progress. The operation against the extremist group began six months ago with the troops advancing at a slow pace but that has intensified since the US-backed airstrikes began in August.